Cape Town - Albie Morkel will play his first franchise game since May when the Titans travel to Newlands on Friday to take on the Cape Cobras in the One-Day Cup. Morkel’s last major outing was for the Royal Challengers Bangalore in last year’s Indian Premier League, with injury having kept him out of the Titans set-up all season. The all-rounder came through a one-day game for Northerns two weeks ago, and will be a welcome addition to a Titans side that made a winning return to the competition last week before losing four players to the South Africa A squad. 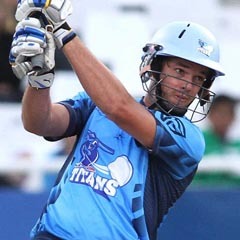 “I think squad strength is important, and fortunately we’ve got someone like a Heino Kuhn to come in and replace Dean Elgar, and Graeme van Buuren who, when he gets his chance, usually produces something special for the team,” Titans coach Rob Walter said. The Cobras will wait until the last minute to find out if any of their South Africa A players might be available to them for Friday’s game, but are not lacking confidence in the young players who have been standing in during their absence. Coach Paul Adams believes the key to their victory over the Lions last week - and to maintaining their place at the top of the table - is carrying a positive mindset in the field. “With the rules demanding extra fielders in the circle you can get into a negative mindset as a bowler that you’re under the cosh, so it’s vitally important that we put a positive spin on it,” he said. * Two other matches take place on Friday with the Highveld Lions taking on the Knights in Johannesburg and the Warriors hosting the Dolphins in Port Elizabeth.